Have you ever received a call or heard a piece of news that cast such a shadow over you that it caused you to want to stop and turn back the clock? To return to a simpler time and place? To hit the reset button and begin again? What is it that would cause you to stop and look at the future—your future? October 28, 2015. The day after my annual physical. A call from my doctor: Something on my blood test. Family history of cancer. Stage 2. Need to see you again, soon. You have Cancer. That call took me from wondering what it might be like to deal with a diagnosis of cancer to the full reality of CT scans, radiation treatments, hormone therapy, radioactive seed implants and a calendar full of tests and appointments. It took me from being recognized at the gym, to being recognized at a building with the word cancer in its title. From being a once-a-year patient to an everyday patient. From thinking about the now, to thinking about the future. From being in control, to out of control. All with one phone call. I’ve climbed mountains for years. I’ve traveled over glaciers and crossed many crevasses. When you pause to look down into a crevasse, the color of the ice turns from white to blue and finally to black. The blackness indicates a crack in the glacier that is too deep for light to penetrate. That phone call from my doctor had taken me to the edge of a very dark hole. It caused me to stop and ask, “What now? Where do you want me to go with this, God?” After all, I’m still young. I’m a husband, a father. My wife and I realized soon after my diagnosis that we had a choice. Either we could panic—question God and ask, “Why me?”—or we could put our whole trust in him. We recognized that when we are taken to a point where all control is out of our hands, there God works most deeply in our hearts. When he is in control, our comfort comes from recognizing that in our weakness, he is strong. I sat down with our grown kids and explained to them that, someday, this was going to kill me. Not cancer, necessarily, but life. I definitely was going to die sooner or later. I knew from the example of my own parents, that as we watch a Christian couple live out their lives, it is a powerful testimony. I could either go to pieces in front of my kids, or use this as an opportunity to teach them that death is just another step in one’s Christian walk. Being at peace with where God has us, and being used in whatever situation he places us—this was a lesson I could teach them most powerfully by simply living it. So what to do with this diagnosis? How can I be light and salt as a cancer patient? How can I minister to others experiencing struggles and challenges in their own lives? The first and third Wednesdays of each month find me at the Swedish Cancer Institute just north of Seattle, sitting in a cancer support group with 5-10 other patients. For an hour and a half, we share with each other. Our successes and our frustrations, our progress and our setbacks. They know that I work in a church. They know that I am praying for them. They know that there is something different about me and my cancer journey. Sitting in this group, I see people who have lost everything: their health, their money, their relationships, their jobs. But the greatest casualty of the trials they are going through is that they have lost their hope. They have endured chemotherapy, radiation, surgery, pain and uncertainty. There is nothing left for them to grab hold of. There is no future for them. They are lost. Hopeless. They don’t know about a Savior who has given everything for them. A Savior who understands suffering and pain greater than they have experienced. Someone who loves them, even unto death. They are a microcosm of the world we live in—alone, lost, hopeless. So what do I do with this diagnosis, this situation God has placed me in? How do I respond to the Apostle Paul’s call in 1 Thessalonians 5, to rejoice always, pray continually and give thanks in all circumstances? I began praying for my fellow patients, for my doctors and caregivers, for my family and friends. During my treatment, I found the perfect “prayer closet,” quiet and private, all my own. It’s called a Linear Accelerator, a photon radiation machine for treating various cancers. 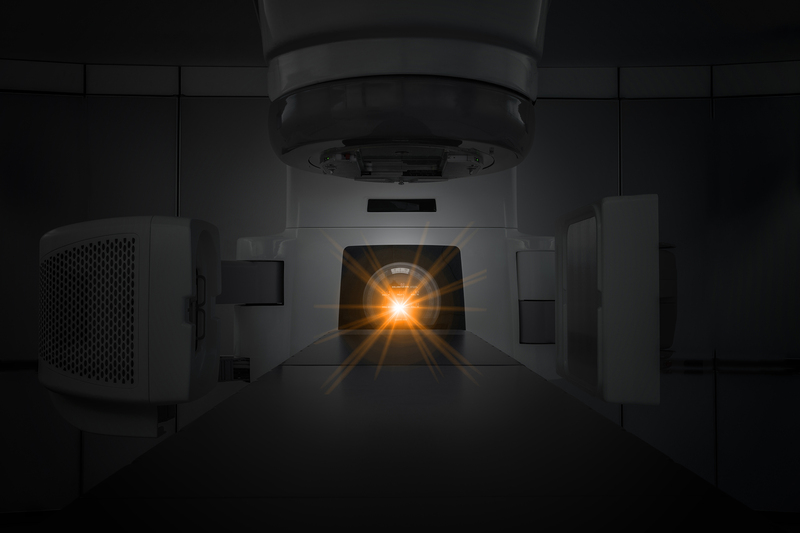 During the eight to ten minutes it took to treat the cancer each day, the technicians retreated behind an eight-inch thick steel and concrete door, leaving me in perfect peace, able to quietly pray. Each day the technicians would ask me, “Why are you so upbeat, so happy?” I told them that in our church, we have various ministries: kid’s ministry, youth ministry, Sunday worship, etc. I told them that this was my cancer ministry, my opportunity to share my faith and hope in a place with a limited, yet needy membership. God wants each of us to come to a point in our lives where we say, “O.K., God, what do you want me to do? Where do you want me to go?” When Jesus called his disciples, some of them were fishing. Yet when he called them, they dropped everything and followed him. They gave up their former lives to minister to others. What could God accomplish in us and through us if we just trusted him enough to drop everything and follow him? Sometimes trust is hard to come by until we are pushed to a point where there is nothing left for us to do but to trust in him–—and to know that whether we live or die, we live in him. As Christians, that is where our hope is found. Jesus died and was resurrected for us. Wherever God has you, go and share the good news! 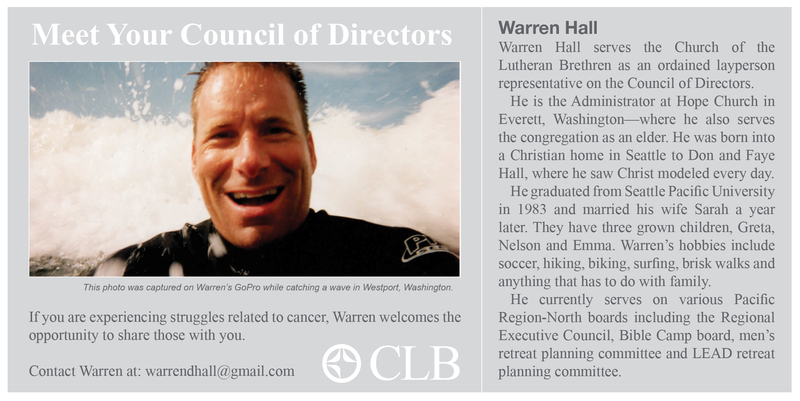 Warren Hall serves as a member of the Council of Directors for the Church of the Lutheran Brethren. He is Church Administrator at Hope Church at Silver Lake in Everett, Washington.